Washburn University’s campus is home to five war memorials dedicated to veterans of the Civil War, World War I, World War II, the Korean War and the Vietnam War. President William Howard Taft visited Washburn University on September 27, 1911. During that visit, the only to the Topeka campus by a sitting president, Taft dedicated a flagpole to the memory of those who died in the Civil War. Although the original flagpole is no longer on campus, Flagpole Rock, in the plaza of flags west of Carnegie Hall, bares a plaque that reads: Erected and dedicated as a silent lesson in patriotism at the base of a flagpole in front of the Thomas Gymnasium. In memory of those who fell in the war for the preservation of the Union by the surviving veterans of Shawnee County in Kansas. A bench at the northeast corner of Benton Hall honors the service of Louis Lloyd Larrick, a Washburn graduate who died while serving in the war. The bench was provided by Larrick’s parents and includes the following inscription: Who sacrificed his life for the perpetuation of civilization in the Great World War. Sept. 27, 1918. Larrick was a member of Phi Delta Theta fraternity and was class president his senior year in the School of Law. He also competed on the football, baseball and track teams. There were 17 other Washburn alumni who died in the war. Students led the push for creation of a student union that could be dedicated to the memory of those who served in World War I, World War II and the Korean War. For example, beginning in 1948, the Independent Women’s Alumni group sold metal emblems of Ichabod that could be attached to a bicycle or car. The cost: $1.10. 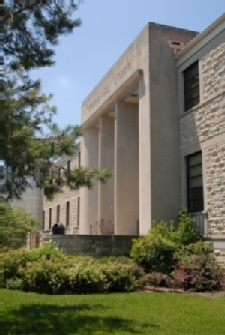 The Memorial Union opened in fall 1951 and was dedicated on Washburn Founders Day, Feb. 6, 1952. Today, a large bronze plaque hangs above the fireplace in the McVicar Room, the Memorial Union scheduling office, on the first floor. The plaque includes the names of all Shawnee County residents, including Washburn students, who lost their lives in World War I (144 names), World War II (469 names) and the Korean War (21 names). It can be viewed weekdays between 8 a.m. and 5 p.m.
Find out how Washburn can support you as a student.